Kanban markers are colour markers, flags, production order tickets or a physical signal with good visibility used in a kanban inventory control system and/or as part of a just in time stock replenishment system. 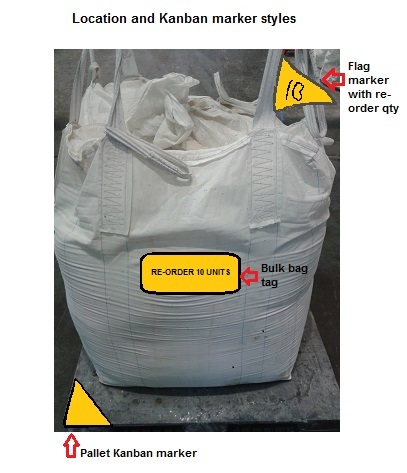 It is a re-order signal that when issued and received by the warehouse or production staff the re-stock process should be initiated. Kanban markers are used in applications where there are several items such as boxes, pallets, items of stock that usually have a production or replenishment lead time and require a safety stock level. This type of system can also be used for items that do not require a safety stock level, and have minimal stockout costs. In these cases the production ticket or marker is placed on the bottom, end or after the last inventory item. The kanban marker, flag or production ticket is placed on the box, pallet or item at which the stock level is equal to the safety stock level. When this stock level is reached and the marker/flag/ticket is visible the operator places it in a designated area where the production planner/manager can either collect or see it in order to pass on that production order to the factory or procurement centre where the re-plenishment of that certain stock item will be organized. Each kanban marker/flag/production ticket usually represents a fixed order quantity. This means that the kanban marker will be a signal to restock an item with a set amount of units. This has usually been calculated beforehand taking into account demand and lead times to re-stock the item. The calculation for this is usually the EOQ formula. These are simple forms of Kanaban markers which together with efficient inventory control can aid in minimizing inventory costs and ensure adequate supplies of materials for any process.